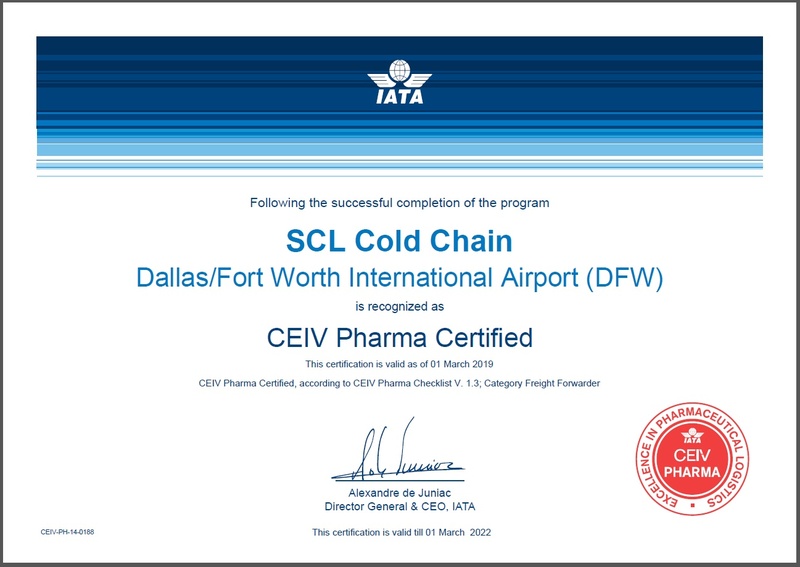 SCL Cold Chain is proud to announce that the Dallas Fort Worth airport (DFW) has been awarded IATA’s Center of Excellence for Independent Validators (CEIV) Pharma certification. DFW is only the second airport in North America to receive the certification, following Miami’s certification in 2015. Four companies partnered with the airport to achieve this distinction, including Expeditors, B.I.G. Logistics, dnata Cargo USA and SCL Cold Chain – currently the only trucking company in North America to become CEIV certified. 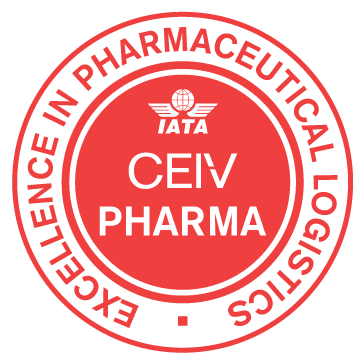 Working alongside aviation industry stakeholders and regulators, IATA created the Center of Excellence for Independent Validators in Pharmaceutical Logistics (CEIV Pharma), to help organizations and the entire air cargo supply chain to get on the right track to achieve pharmaceutical handling excellence. CEIV Pharma addresses industry’s need for more safety, security, compliance, and efficiency, by the creation of a globally consistent and recognized pharmaceutical product handling certification. Beginning in September 2018, the rigorous certification process took months of training and a strong capital investment in equipment and staff education. The equipment required must be certified with redundant protection and annual calibration of instruments to prevent temperature excursions from spoiling pharmaceutical cargo. Four members of the SCL team went through the CEIV training courses with 16 more trained internally in an ongoing continuing education in the standards necessary to meet the CEIV requirements. While the certification process was rigorous and difficult, we at SCL Cold Chain are bursting with pride for our team and cargo community that we achieved this milestone. We believe this will allow us to bring life-saving cargo to people who desperately need it and ensure that these medications are in the best possible condition. This experience has been a labor of love and an integral part of our commitment to quality in service. (844) 4SCLDFW | Copyright © 2019 | SCL Cold Chain | All rights reserved.